and some important Oracle Database - Optimizer Statistics regarding its actual execution. Autotrace is fully accessible to each developer while tkprof relies on access to a trace file. “set autotrace on” doesn’t work with a PL/SQL procedure. cost : The cost assigned to each step of the query plan by the optimizer. The Optimizer Oracle Database - The Query Plan Generator generate many different Sql Engine - (Physical|Execution) Plan for the same query and the Oracle Database - The Query Plan Estimator assigns a cost to each and every one. The execution plan with the lowest cost wins. In the full outer join example, we can see the total for this query is 13. Rows (of Card as Cardinality for 9i) : It's the estimated number of rows that will flow out of a given query plan step. In the full outer join example, we can see the optimizer expects there to be 518 rows in EMP and 80 in DEPT. Bytes : The size in bytes of the data the optimizer expects each step of the plan to return. This is dependent on the number of rows (card) and the estimated width of the rows. In 9i and below, if the cost, card and bytes is not present, it's a clear indicator that the query was executed using the RBO and not the CBO. 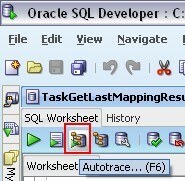 The second part of the autotrace output are the session statistics.